Give your entertainment space some extra seating with this reclining sectional sofa. Padded track arms and block feet offer a clean, contemporary look to the piece. Foam filled cushions provide excellent comfort, making it easy to unwind and enjoy time at home. 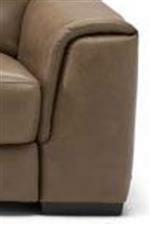 Power reclining in the arm recliner section puts you in control of impressive positioning. The Davide Contemporary Power Reclining Sectional Sofa with Padded Track Arms by Natuzzi Editions at Williams & Kay in the Anchorage, Mat-Su Valley, Eagle River, Alaska area. Product availability may vary. Contact us for the most current availability on this product. B969-076 Wedge 1 49" 49" 36"
B969-001 Armless Chair 2 28" 41" 36"
B969-D52 RAF Power Recliner 1 44" 41" 36"
B969-047 LAF Chaise 1 39" 64" 36"
Give your living room a modern feel with the Davide leather upholstery collection. With many reclining and stationary pieces to choose from and hundreds of leathers available, you will be able to make your home look any way you want. Padded track arms and wooden block feet provide a clean look to the collection, while foam filled seats and backs give you the comfort and support you look for in living room furniture. Relax and enjoy the quality and contemporary style that the Davide collection will bring to your home. The Davide collection is a great option if you are looking for Contemporary furniture in the Anchorage, Mat-Su Valley, Eagle River, Alaska area. Browse other items in the Davide collection from Williams & Kay in the Anchorage, Mat-Su Valley, Eagle River, Alaska area.